In 2013, we staged the world's first theatrical adaptation in London to critical acclaim at The New Diorama Theatre. The UK production sold-out 9 months in advance and in 4.5 hours breaking the New Diorama Theatre box office record.breaking the box office record selling out in just 4.5 hours and in Tokyo played to sold-out houses at the AiiA Theater and featuring at Nico Nico Cho Party 2 Tokyo to 30 million online and 5000 in house. Adapted by the ensemble and the director from the English subtitles and a new translation by Yuriko Miyake. Whilst in Japan, we were privileged and honoured enough to meet the creators of the film. 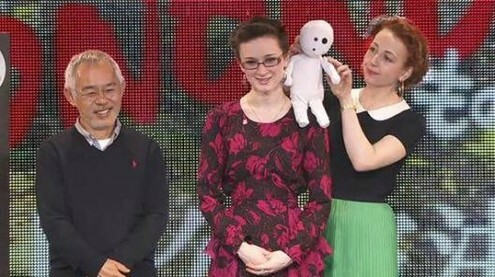 Toshio Suzuki, producer of Studio Ghibli, told us how much he enjoyed the show and invited us to visit the Ghibli animation studios. We were so grateful and honoured beyond words to be invited. Here are a couple of photos of us at the studio!